Fetal Pose Is A Yoga Position…Right? Are you looking for a way to feel a little less ego-tastic? Do you think you’re the bee’s knees? The Cat’s meow? Rest assured I have found the solution that will make you feel the exact OPPOSITE of all those things. This is starting to sound like a horrible infomercial for a product nobody would ever want to buy. Stick with me. Also, ego-tastic? Not a word. I’m aware. Relax peeps, in recent years my navigation skills have drastically improved. Living abroad (twice) played a large role in me figuring out that calling somebody when you’re lost and telling them you’re passing a Wal-Mart is NOT the correct answer when they ask you to describe where you are. I guess street names might be the correct answer in that situation? c) eating at the sketchy Chinese restaurant won’t give you a stomach ache. Living in the city has shown me a completely new side of myself. Allow me to toot my own horn for one moment and say that emotionally and mentally, I am a pretty tough cookie. In other words, I made it through Paranormal Activity without closing my eyes and I made it through Charlie St. Cloud without crying. So pretty much, I’m so tough, I belong in The Hunger Games. Me: Can you teach me how to shoot that bow and arrow? Katniss: Can you teach me how to Dougie? It has shown me the side of myself that wants to curl up in fetal position. You might think I’m using fetal position as an analogy for being really upset, but I promise that there were ACTUALLY park benches and door stoops that looked pretty good. Today, after four hours of unsuccessful apartment hunting, I literally curled up on the couch with a cup of tea and had a good cry. Do you want to know what sparked this emotional melt down? I coulnd’t get the television to work. I promise I was not crying because I was missing the latest episode of Mob Wifes, it was more the fact that there have been so many changes in such a condensed period of time and I just felt overwhelmed. I could have probably gotten away with leaving that part out had I stuck with the whole “tough as nails” thing, but if we’re being honest (because we’re always honest, *Fistbump*) this past week went by so quickly that I didn’t really have time to process any information that didn’t have to do with my job. My first week in New York City has proven to one of the most challenging weeks of my life. I might even go as far to say it has been THE most challenging week of my life. If you’re new to New York, chances are, you will not rock on your first try. Still, I am determined to get to know the ins and outs of this fascinating, chaotic city. I wish I could successfully put on paper the number of times people have said “how did you get lost? There are numbers!” NYC is a parallel universe where numbers and street names are obsolete and every street looks exactly the same. If you’re from New York, ignore that statement because you were probably born with superpowers. Also, you can’t trust your iPhone or Google Maps. The poor little blue dot on my iPhone was as lost as I was. One minute it would tell me I was going the right way, and the next minute it would tell me I was going three streets, five hot dog stands, and fifteen Starbucks in the wrong direction. Before I knew it, it was 8:45 and I was supposed to be at work. Also, that sketchy Chinese restaurant on the corner of 700th and Whatchyamacallit? Always a bad decision, but that’s self explanatory. Yes getting lost is kind of tough above 14th street. All rectangular boxes, and it’s an island. If you hit water (or Central Park), turn around – it’s in the other direction. Breathe. Believe me, it gets easier. Before you know it, you’ll have all of this stuff down and you won’t have to look it up every time you go out. I don’t know whether anyone’s told you the general rule of Manhattan (above 14th St) yet, but streets run east and west. Evens go east, Odds go west except for the few that go both ways, but as long as you know even is east, odd is west you can figure out north by standing as if east was to your right, north with be in front of you. Avenues run north and south. Broadway breaks all the rules and runs diagonal on a NW/SE trajectory. Ugh, I feel anxious FOR you knowing full-well I could be living anywhere from L.A. to NYC a year from now. My navigational skills are… lacking, despite my occasional (and misguided) confidence in them. I’m still proud that I know general directions of places I’ve lived in MY WHOLE LIFE. But anyway. Know that if you stick it out and get used to NYC, you are an official badass who can handle anything. You can do it, gurrl. Gosh, pull yourself together already…JK. But there is DINNER WITH ME at the end of the rainbow. In 18 minutes, actually. Love it! Not your frustration and melt down but your honesty! I love the humor amongst the chaos and finale picture too! I always thought NYC would be a place to live for at least six months just to say I did it and survived. Hmm, luckily I am not at #897 on my bucket list just yet! I hope the coming weeks get better for you — chaos is no fun and any pose you want to strike can be a yoga pose – its all about the breath anyway! Namaste! I feel like if I can survive New York, I can survive anything! I think that’s the general mentality here. The week wasn’t negative, it was just challenging! 🙂 Thank you for your kind words. I’m starting to adapt to the chaos! 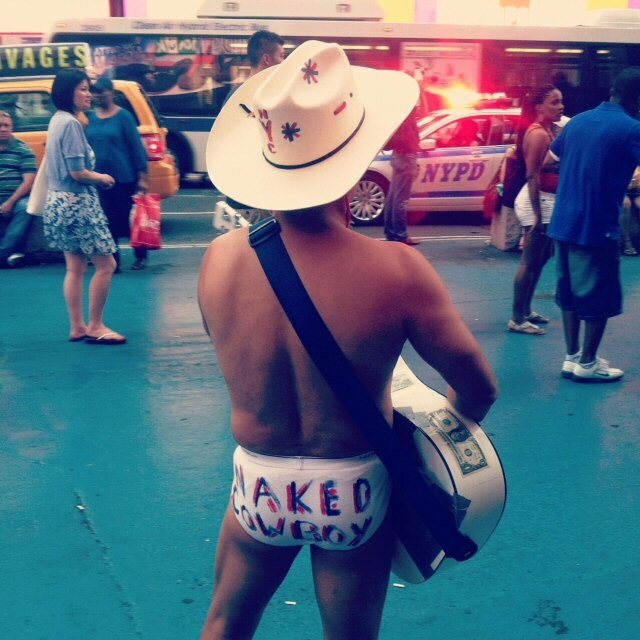 But the naked cowboy obviously cheered you up right? No? Well it sure put a cherry on my Tuesday. I know Em! Where have you BEEN?! Oh that’s right, just all over the world. No big deal! Thanks for writing that. I’ve been feeling the same way lately. A fetal-position meltdown sounds therapeutic. Honest post Carley! I’ve been reading your blog for a while now, and based on what I “know” of you I know you’ll come out on top of this situation fist-bumping, high-fiving and taking names! You got this! Previous PostHAY GIRL HAY! Nah, Hay Is For Horses.